Desert landscape is one of my favourite environments for landscape photography. I love it just as much as seascape photography. Unlike popular opinion, the desert is full of life and stories. Of course, as any sub-genre of photography, it has its nuances and approaches to make it work. In this article, I’m going to give you a quick guide on how to start with desert photography and get the most of your trip. There are various types of the desert landscape landforms – rocky one, sandy one, icy one. Each of them in unique and special and requires quite a lot of preparation for the successful trip. Desert requires somewhat out-of-the-box thinking to see all the hidden possibilities. And of course, safety is paramount too. 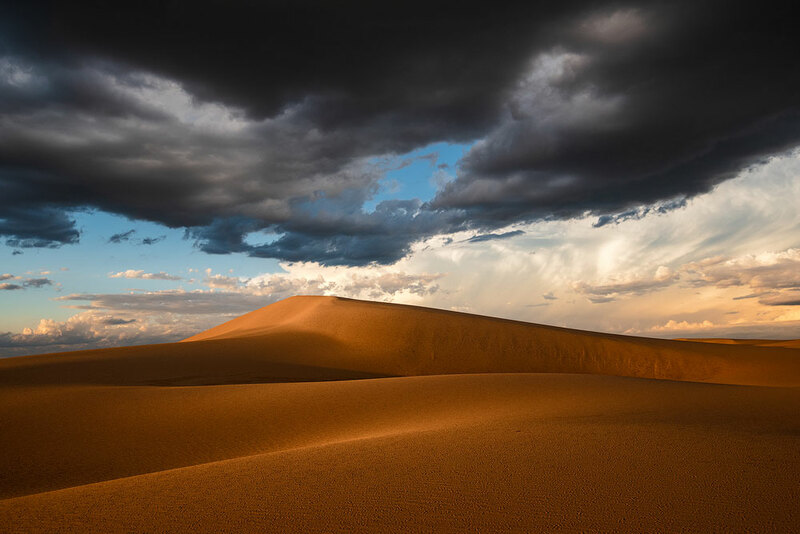 The desert is a barren land with very little or no precipitation at all. The desert is not good for most plants and animals. And for humans too. These arid lands cover about 11% of the earth (or 20% including icy polar desert). 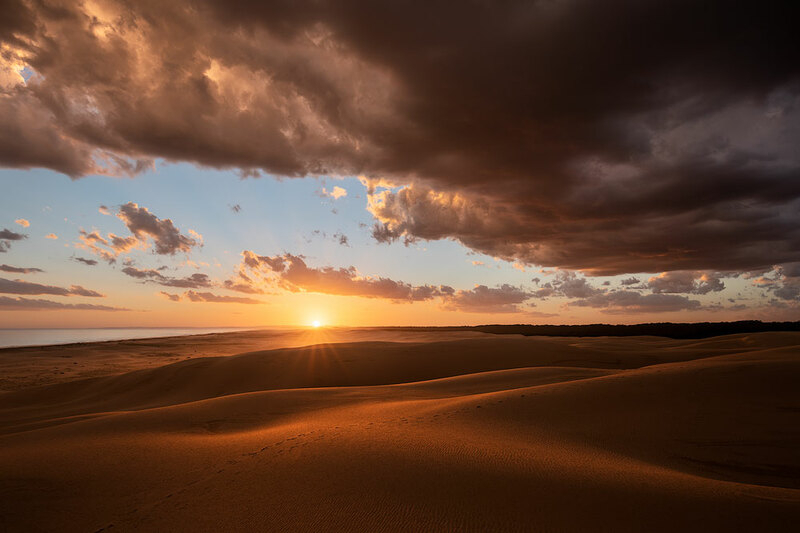 The deserts are of the following types: mid-latitude, trade wind, coastal, rain shadow, monsoon or polar deserts. First and foremost is safety concerns. Desert is barren for a reason. There is no rain and typically no shade. Such weather means that the hot season isn’t any good for the travel. For instance, in Death Valley, the temperature can reach 57C, which is beyond good and evil. Therefore, do research beforehand to get monthly average temperatures. Another safety concern is the wildlife. It could be too far away from anything if you get stung by a scorpion. So consult local tourist sites and see if there are any dangerous creatures and what you should do if you encounter one. Appropriate footwear. The actual type depends on the desert. If I would travel to the Death Valley or Jordan, I’d use some good hiking boots. When I go to the sands of Port Stephens here in Australia, I wear Crocs. Wear closed boots if there’re cactuses or small rocks all around. I also love to have an apple with me as it helps with hydration. Pro tip: Don’t go barefoot for a long time as the sand could peel the layer of the skin off making it hard to walk at all. A camera with extra batteries and SD cards. A blower. Typically I don’t have an air blower with myself, and it stays at home longing for my return. Unless I’m going to the desert. I use it to blow off sand from the tripod joints and other hard-to-reach places. A Lenspen. I always have it with me, but it’s essential in a desert. It helps to wipe off sand from the hard-to-reach spots on camera in case it gets there. One example is the bayonet connection. Another one is the moving part of the zoom lens. A defensive cover for the lens body. My wife made one for me, but I’m sure you can find something similar. It’s a cover you put on your lens to protect from the flying sand. Alternatively, you could use a plastic bag. An umbrella or a rain jacket. What? In a desert? Yes, it’s to prevent the camera shake caused by the wind. Filters (polariser, neutral density filters). We’ll discuss lenses in the next chapter. Try to cover as much of the focal range as possible. I mean it – in a desert you can create perfect images using any lens. 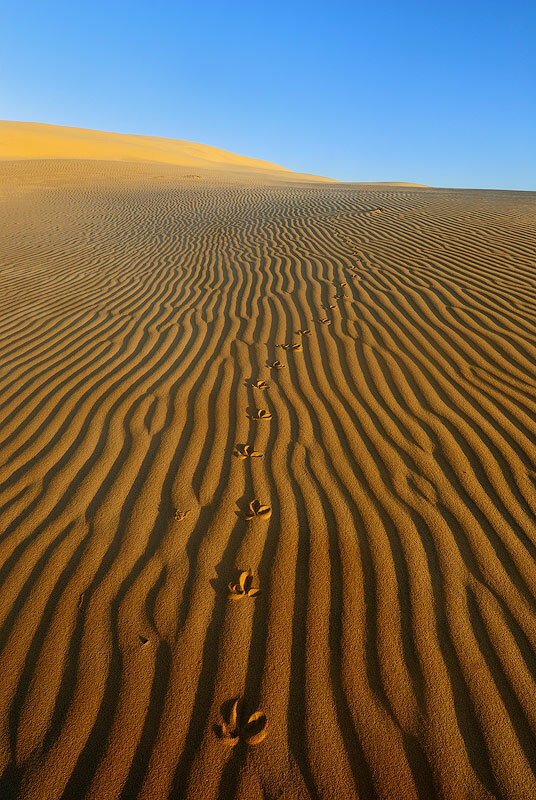 Sometimes wide-angle works best for the desert landscape – when you have some interesting patterns or structures. On other days, wide-angle is useless, and telephoto is your best bet. And you can’t substitute one with another; they are all different. At the absolute minimum, you need to cover 20-200 mm, and I prefer to have it even wider. On my full frame camera, I have 15-30, 50 and 70-300 mm. And sometimes 300 is not enough to build some abstract shots. Two desert trips ago I used wide-angle 90% of the time. On my recent trip, 90% went to the telephoto, and I wouldn’t bring any good shots if I had only wide-angle. We’ll discuss the reasons behind it later. Desert is seemingly barren and devoid of everything. But, first of all, it isn’t true, and secondly, simplicity is the key to success. The subjects to photograph are all around. Some of them are more exaggerated than in a typical landscape; some are non-existent. For instance, you won’t find a green tree to build the composition around, but you’ll see a sand pattern like nowhere else. The biggest attraction is all these various patterns that you find everywhere in the desert. 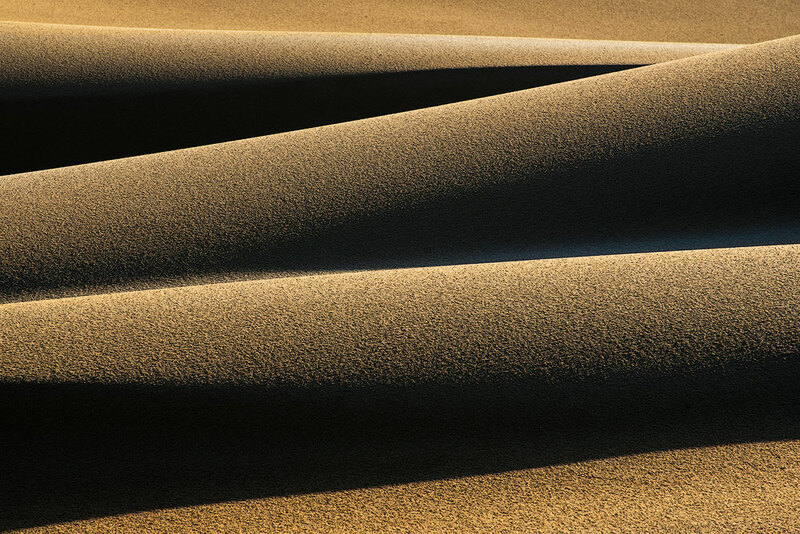 Photographers often build desert images around these patterns. They work great for the foreground on wide-angle lenses. Also, they are sometimes quite good for stand-alone photos. These patterns include dry land cracks like you have seen in so many Death Valley photos. The desert landscape is all about minimalism, so such separation works perfectly within the context. Find a crisp dune with a nicely outlined contour. Preferably an arabesque one or something equally elegant. 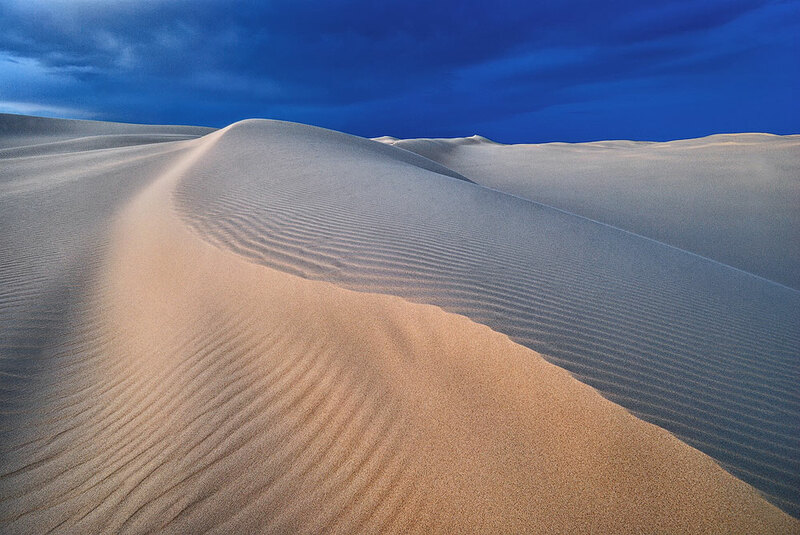 Find an angle where it doesn’t overlap with other surrounding dunes and do a few shots slightly changing an angle. Photography is about storytelling, and we can easily tell a story of life and death, of loneliness using some dead trees standing against some dunes. The only thing is to clean up the mess around the trees (small branches, humps, etc.) to make the contrast even stronger. The rain will ruin sand patterns, that’s true. But in return, it could produce a blooming meadow. Well, maybe not that epic but it can do big things to the barren land. Keep an eye on the weather and plan accordingly. Alright, remember how I promised to talk more about telephoto lenses? Here we go. Let’s imagine we are in the desert after some substantial rain. All patterns are ruined, all fluff is gone, and the flowers didn’t make it yet. What to do, pack up and go home? No way! All we need to do is upscale. Think bigger and build patterns using larger objects – the dunes, their crests, shadows and reflective surfaces. For that, we need a longer lens. We don’t care about the small patterns anymore; we need large ones. Mirage is something yet to photograph for me. It’s not that hard to spot and shoot if you are looking for it. The only serious difficulty is that you need to be in a desert during hot weather, which is something I try to avoid. Of course, you have better chances for it to work in a sandy environment. Unlike any other landscape environment, the desert landscape is so full of geometry that it’s hard to go by. For this, you’ll need a telephoto lens again. Find some rhythm or repetition or a beautiful curve, zoom in and capture. The possibilities here are endless. As the light changes, the patterns, the shadows shift revealing new structures and new shapes. You can do geometry shots all day. Pro tip: for the abstract zoom landscapes like the one below, you may need focus stacking to achieve an acceptable depth of field across the whole image. The wind deserves a special chapter in the desert pictures world. Strong wind is dangerous for your camera and beautiful for your shots. It could be hard to capture flying sand against the dunes of the same colour unless it’s really a storm wind. The easy way is to photograph the wind against the blue sky or anything of different colour. The desert is large, but it isn’t endless. It has to end somewhere. And this fringe is another good subject to photograph. The sand is beautiful, but the wow-factor comes from the difference. So use some strong contrast from the difference of the environments. The best contrast would be the sand and the sea because they are opposite. Another good one is sand and the mountains, etc. Use one of these artefacts, and your desert image will instantly level up. 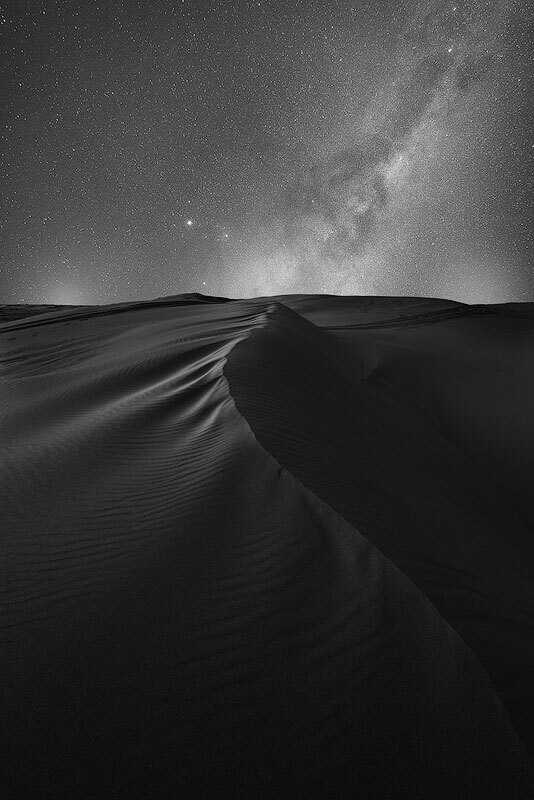 There are two conditions when the desert is beautiful in the darkness. One is when shooting the stars, the other one is when the sky is so bright that it feels like you have a light source. Otherwise, I find the desert quite boring before sunrise or after sunset. You can shoot a bit while the skylight lasts, but usually, it’s not strong enough to bring up the textures. Therefore, I prefer to start photographing a short time before sunrise and then all the way into the day. For the typical landscape, you have to align your schedule with the golden hour. This rule also applies to the desert; morning and evening light is the best. However, because the dunes are all over the place with their slopes having different angles, you can literally shoot all day and still see the textures. Just follow the Sun and the dune shapes. Look up the future position on the Milky Way or some interesting stars/planets. There are many apps. I use “PlanIt! For Photographers”. Find a great spot with some prominent lines, which align perfectly with the Milky Way. Set up your gear, keep making shots every 5-10 minutes. Please manipulate the settings using a trigger or a remote without touching the camera. Wait for the stars and shoot. For the wide-angle lens, you need to use 20-30 seconds max to keep the stars as dots. Set aperture to the max value, like 2.8 and ISO to around 3200 or 6400 (it’s very dark). These settings should do the job. You could also use any additional astrophotography features like including the Moon (up to 1/4 of size), including the cactus silhouettes of the if you desert has them, etc. Honestly saying, the blue hour in a sandy desert is quite dull. The contrast is very low, and everything looks flat. Of course, there is some skylight, but it’s not enough to bring out all the textures. The photos will need some serious editing to reveal all the patterns and structures. 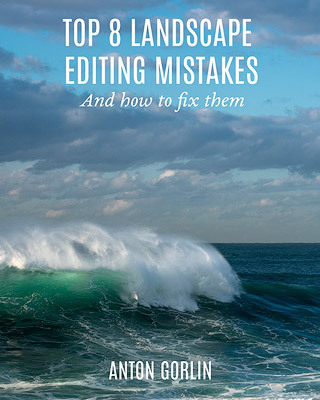 If you are good at editing, you’ll know what to do. Basically, you’ll need to work locally with the contrast in multiple areas carefully revealing what’s already there. Sometimes the clouds are glowing red or purple, or the skylight is very strong hitting the reflective side of the dune. In this case, good photos are possible. Another possibility here is black and white. If you extensively add the contrast, it may bring out some terrible colours and artefacts. Such an issue is easy to avoid in black and white. Such scheme adds to drama even more and doesn’t risk losing some beautiful colours. My favourite period to shoot the desert landscape for many reasons (unlike seascapes, where I prefer the Blue Hour). 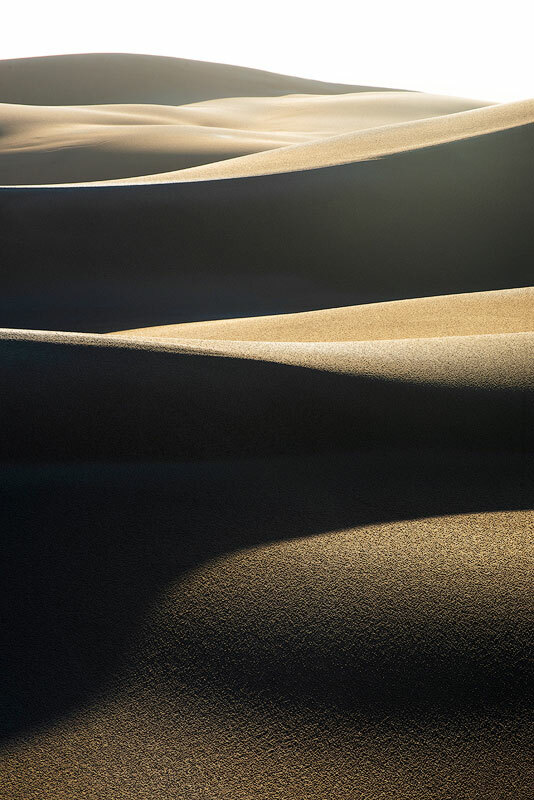 The surface is not level and every dune or hump creates a shadow, and these shadows start moving as the Sun goes higher. Sometimes the pattern you find perfect lasts for mere seconds, so be quick. The morning light paints the sand orange-red, and it feels hot and glowing, especially the crests. Also, while shooting towards the Sun, you may accentuate the contours with having all else in the shadows. The low position of the Sun also brings out all those tiny patterns and if you have any around, start with them as these shadows are the first to cease. The general approach in landscape photography is to skip the daylight hours and wait for the next Golden Hour. Well, it doesn’t work in the desert. I agree, evening and morning are amazing but don’t let yourself miss some great photo opportunities. The reason behind skipping daylight hours is the lack of shadows. We can’t see many of them, that’s true, but the dunes are not flat, their slopes can go on any angle. Therefore, if the slope is parallel to the light direction, you’ll get all the shadows you want. Another case is the mirage and the hot air rising from the sand or the rocks. To make use of this air, you need some objects in the distance, which become fuzzy and blurry due to it. Also, during the day you are getting vibrant true colours. Desert is beautiful and challenging. It requires some extra safety effort while preparing for the trip. The best thing about desert pictures it that such area is so full of stories and subjects to photograph. It works in every weather and can quickly stir up your creative juices. I really like the consistency of your work. 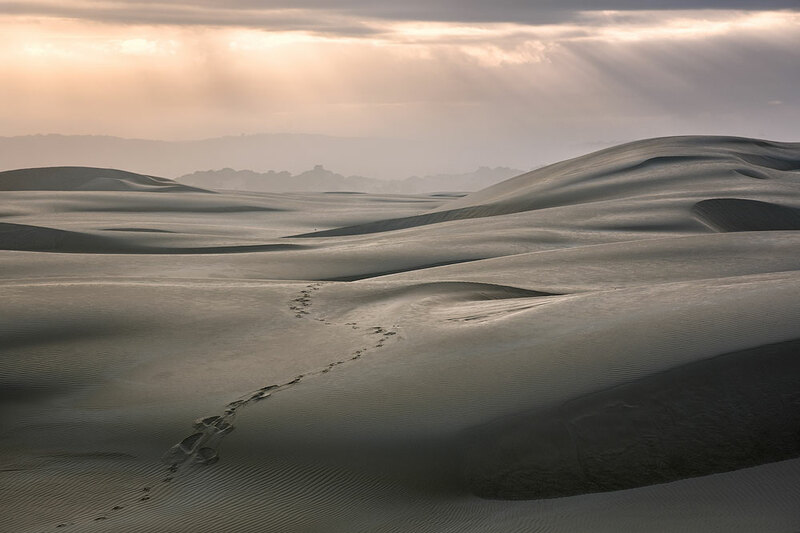 Here in the States we call it Dune photography as there are other connotations of “desert photography”. 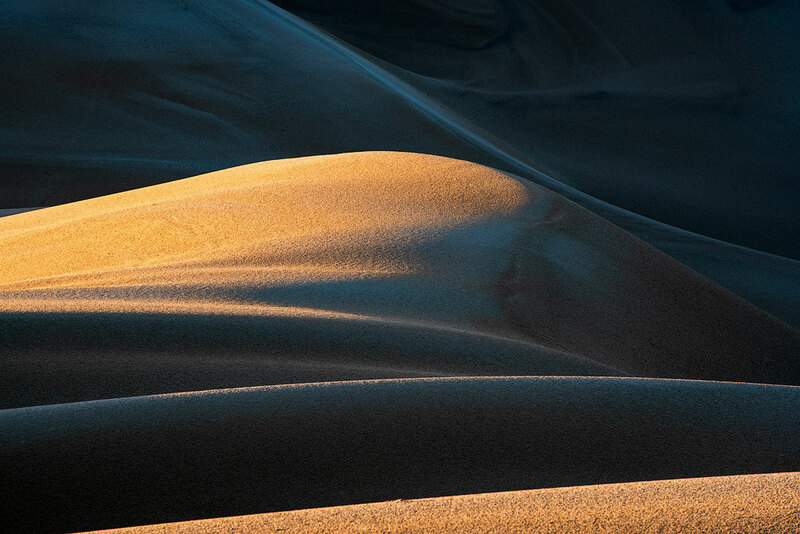 Sand dunes seem to connoted their own subcategory of landscape photography. In many deserts you can find dangerous snakes. Especially in Africa. So be careful. In some African deserts (e.g. Namibia, Mali) you don’t want to have apples or other fruits in your backpack or tent. You can find desert elephants there (So far desert elephants are not recognised as a separate species, but they are well adapted to a life in the desert). They will destroy your tent (or you) for an apple. In many deserts you can also find some wells or oasis’. Never build your tent there, if it’s not already populated by humans who live permanently there. There is always (wild)life in the desert. Animals need to drink there. Wildlife can not come to drink, as long as you are there. If you are driving a 4×4 through the desert: Stay on existing tracks – especially on pans or valleys with a harder surface between the dunes. There is always life – even if you can’t see it. You will destroy it with the weight of your car. The new tracks that you produce are new scares. These scares will probably stay for decades, sometimes for hundreds of years. Track pollution is one of the main ecological problems in some parts of the desert in Namibia. Many people have already drowned in the desert. I know: sounds crazy. But for example in the Kaokoveld in Namibia or the Rub Al Khali on the Arabian Peninsula you can experience this: No rain. The sky is blue. Not a single cloud. Suddenly there comes a high flash flood. Because it has rained a lot 100km outside of the desert and the water is flowing through some valleys or old dry riverbeds in the desert. So always know you environment and be careful where to park your car and where to build your tent. wow, this is super helpful. Do you mind if I include this in the article? How do I credit you?